Leonard Cohen is the most popular Canadian poet of the last four decades and became even more famous with the recording of his songs both by himself and many other singers. In the 1960s his books of poetry, The Spice-box of Earth, and Parasites of Heaven along with his novel, Beautiful Losers, contributed to the flowering of Canadian literature. Leonard Cohen was born in Montreal in 1934 and later attended McGill University where he met other writers such as Hugh MacLennan and Irving Layton. Before graduation he published Let Us Compare Mythologies (1956), his first book of poems. This was followed by The Spice-box of Earth (1961) and a novel, The Favourite Game (1963). He travelled and lived in Greece (a 7-year stay), New York, Montreal and California where he spent time in a Zen centre studying Buddhism. He continued to produce poetry collections: Flowers for Hitler (1964), Parasites of Heaven (1966) and Selected Poems (1968). His most popular novel, Beautiful Losers (1966), was also controversial with its mixture of history, religion and sexuality. At about this time Cohen also began to write and sing his own songs and make recordings. This change in genres was a natural transition from his poetry. 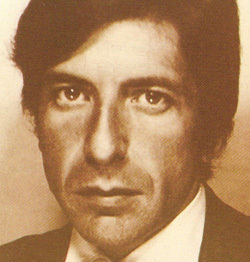 His first album, Songs of Leonard Cohen was released in 1967. He became an international success as a songwriter and singer, a celebrity status which overshadowed his literary achievements. His most popular songs include "Suzanne," "Hallelujah," and "Bird on a Wire." His other books of poetry include, The Energy of Slaves (1972), Death of a Lady’s Man (1978), and Book of Mercy (1984). His record albums include: Songs From A Room (1969), Songs of Love and Hate (1971), Death of a Ladies' Man (1977), Various Positions (1985) I'm Your Man (1988), and The Future (1992). His book, Strange Music: Selected poems and songs (1993) is a blend of music, poetry and fiction. From the beginning of his writing career Cohen has been the subject of magazine articles, academic essays, and later books. When you do an online search for Leonard Cohen you will get 15 million items; 99% are on his music and lyrics. On October 7, 2016, Leonard Cohen released his last album, You Want It Darker, which was well-received by both critics and the public. This was his 14th studio album and was produced by his son, Adam Cohen. One week later, on October 13, the Swedish Academy awarded the Nobel Prize in Literature to Bob Dylan, the American singer-songwriter, “for having created new poetic expression with the great American song tradition.” This is a recognition of the poetic qualities of many song lyrics and a reminder that in the long tradition of poetry much verse was composed to be sung or recited out loud. The lyrics of Leonard Cohen’s songs demonstrate recognizable literary qualities in imagery, sound, subject mater and new poetic expression. One month later, on November 7, 2016, Leonard Cohen died peacefully in his home at age 82. He is buried in a cemetery in Montreal, Canada.